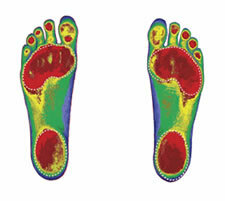 Custom orthotics provide a solid foundation for imperfect feet. Our doctors can digitaly scan your feet and within seconds you will see your unique foot print. Just like no two people have the same finger print, no two people have the same foot scan. Therefore, generic inserts found in local retail stores may not provide you with the corrective treatment you need. Many insurances will pay in part or in full for the custom fit pelvic stabilizers. However, we are offering a huge savings.